Fords early success in the European Touring Car (ETC) Championship with the Capri RS2600 during the 1971 to 1973 seasons was at an end with the BMW 3.0 CSL (Batmobile) soundly beating the Capri’s in the latter part of the 1973 season. With the FAI rule changes, in mid 1973, allowing for road homologated wings to be used for racing, Ford commenced a program which led to the RS3100 road car, the homologation version of the Capri racer. 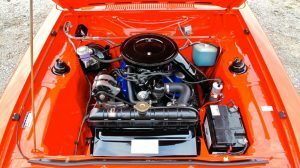 With the RS2600 Weslake engine program having achieved the maximum possible output from the German 2.6 litre engine Ford switched to the ‘Essex” 3.0 litre V6 engine with Cosworth given the job of producing a reliable racing engine from the unit. Cosworth commenced some development work on the ‘Essex’ engine as early as May 1972. Ford agreed with Cosworth that a bored out 3.1 litre engine was a good basis for the future racing engine. Hence the birth of the Capri RS3100. Ford Advanced Vehicle Operations (AVO) looked at the success of the BMW “Batmobile” with its aerodynamic spoilers and wings in developing the RS3100. Spoilers had never been homologated for the RS2600. Ford AVO developed a ducktail spoiler on the boot and a small lip spoiler on the front which helped high speed stability with wind tunnel tests yielding a Cd figure of 0.37. RS3100 production began in November 1973 at Halewood with very sketchy details of the models production run, however, by January 1974 the run had finished with only 248 RS3100’s officially completed with all being right hand drive. The RS3100 was homologated in January 1974 for the 1974 ETC season. 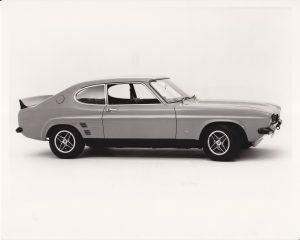 The short run for the RS3100, which was based on the MK1 3000 GT, was in the main due to the overlap with the Capri Mk2 production due for release in February 1974. 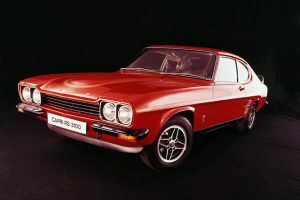 The RS3100 was an expensive road car at GBP 2450 and with the mid-1970’s oil crisis the RS3100 was not a popular seller in a fuel starved Britain. This prompted Ford to export 50 of the remaining RS3100’s to Australia, these were in Australian showrooms around July 1974 at a cost of around $6250, more expensive than a current model Falcon GT (source Wheels July 1974). The RS3100 shared the suspension, brakes and AVO 4 spoke alloy wheels with the RS2600 and in appearance it shared the later version RS2600 black quarter front bumpers and full width black rear bumper and quad headlamps. The distinguishing features were the large matt black rear spoiler, front bib spoiler, dummy louvers, flared front fenders and the unique color schemes. RS3100’s were available in; Diamond White, Daytona Yellow, Sebring Red, Modena Green, Stardust Silver, Olympic Blue and Marine Blue all with Gold decals around the power bulge, rear panel and a triple line down the sides. Interior was straight out of the UK 3000 GXL with a 130mph speedo fitted. Essex 3.0 litre 6 cylinder vee formation at 60 degrees bored out 60 thou to make 3093cc. 9.1:1 compression ratio. Blue painted rocker covers are fitted to differentiate the engine from a standard 3 litre engine. Webber 38 DGAS twin choke carburetor. Development work undertaken and completed by Cosworth Engineering of Britain. Twin tail pipe exhaust. Standard road tune developed 148bhp at 5200 RPM and 187lb ft of torque at 3000 RPM and achieved performance figures of ; 0 to 60 mph in 7.3 seconds with a top speed of 125mph. Indicating speedo to 130mph. Modified front cross member to move suspension arms outwards to provide negative camber (-30’ +/- 30’). Stiffer front springs combined with heavy duty Bilsten Gas Dampers. Competition single leaf rear springs combined with uprated Bilsten Gas Dampers, special bump rubbers and spacer blocks. Standard Granada top loader 4 speed box (Type E) coupled to Atlas diff with 3.09:1 Ratio. Matt Black paintwork on the sills and rear panel with Gold stripe work. Four US style headlights with indicators inset into the front quarter bumpers. Front wheel arches lightly flared housing AVO RS 4 spoke alloys. Dummy louvers on the rear quarters, 2 per side. Flat 2 spoke steering wheel. Capri 3000 GXL interior trim. 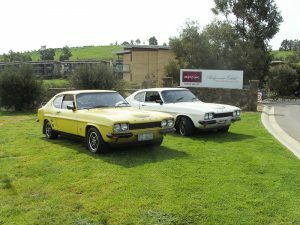 Ford Australia undertook a number of minor changes to meet Australian Design Rules, specifically; the chrome exterior mirrors and wipers were painted black, inertia reel seatbelts were fitted and headrests were fitted to the front seats. Ford dealer options were also added in some cases with a popular addition being RS3100 letters to the rear spoiler. The RS3100 manufacturers plate is fitted to the drivers side inner wing and will detail the Chassis Number, this number will always commence with BBECND followed by a 5 digit number depicting the RS3100 serial number. Next to this plate is another plate painted the same color as the body where the same Chassis number will be stamped. This plate will also detail the cars color followed by the letter A i.e. Sebring A with the words SPA SPECIAL on the bottom line of this plate. The Chassis Number is also stamped into the suspension reinforcing plate on the driver’s side inner wing. 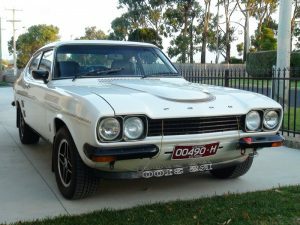 The RS3100 has gained a strong following in Australia and has gained the mantle of a rare and prized collectors car. Information in this article obtained from “Essential Ford Capri” by Chris Rees and the Capri RS 3100 owner handbook supplement.